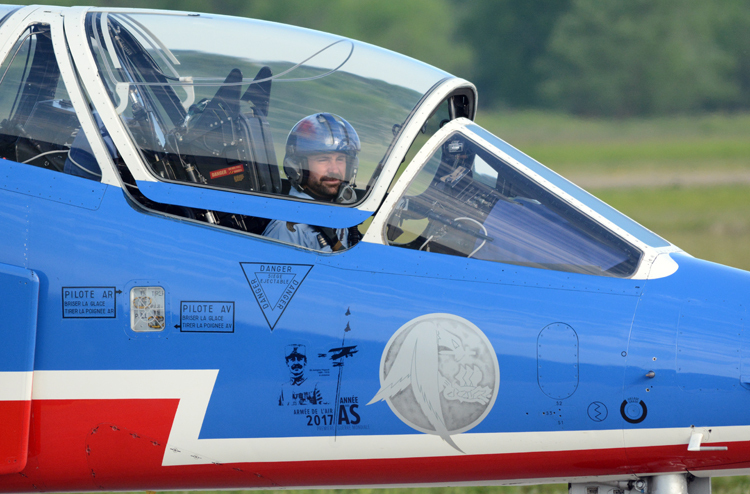 When the Patrouille de France travelled to North America in early 2017, they brought along a slice of French military aviation history with each of their Alpha Jets. 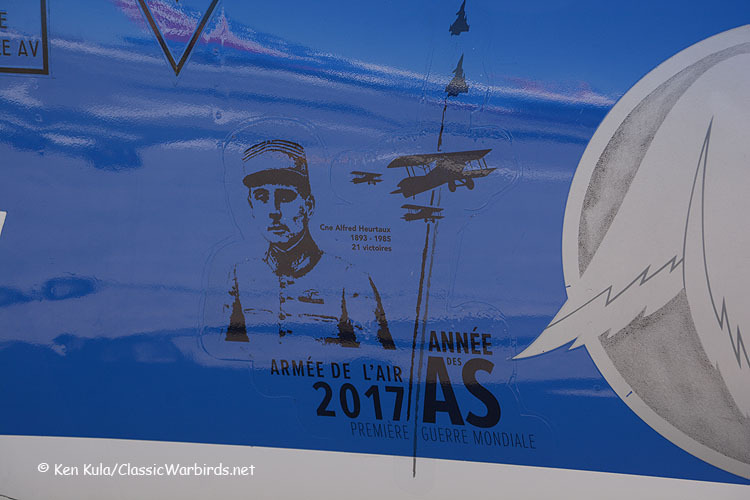 All eleven of the trainers were emblazoned with a silhouette and name of a World War I ace of the Aéronautique Militaire, carried aloft each time the team flew. 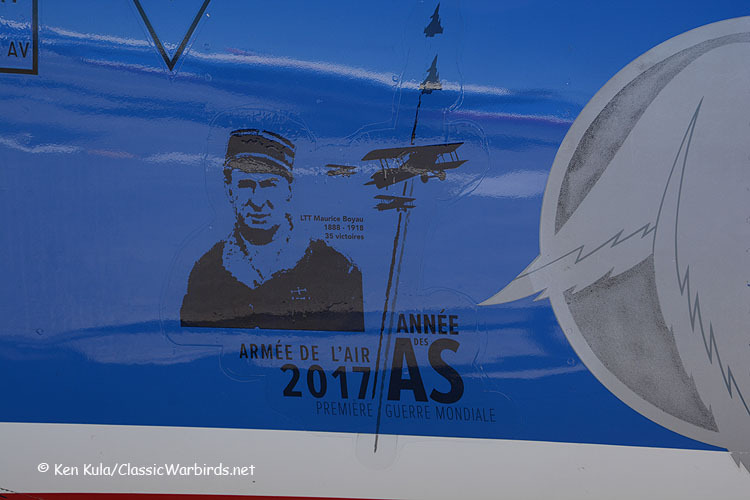 The sentimental nose art, applied under each jet’s canopy on the right side, was displayed as a commemoration to honor France’s Flying Aces. 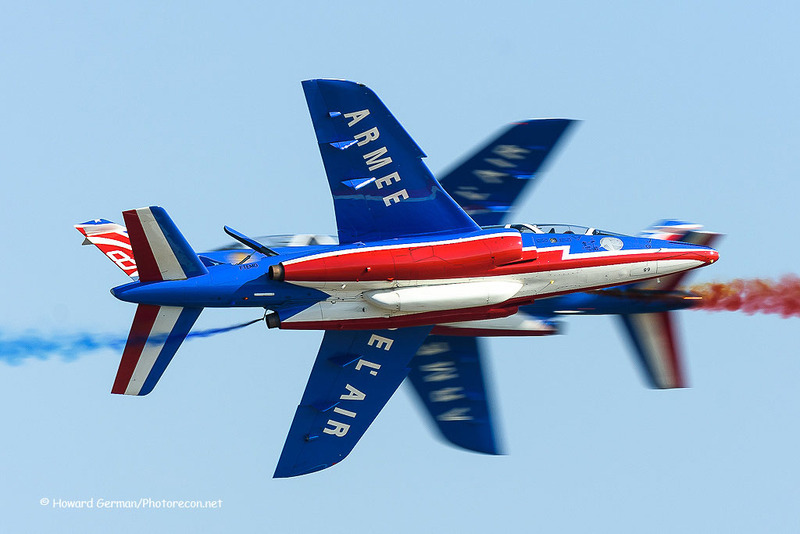 According to an Armee de L’Air press release, “The Flying Aces are a symbol of the French Air Force. The term Flying Ace was first used on 1915 to describe a military aviator whose name was listed in the Armed Forces official communiqué for shooting down five or more enemy aircraft. The process of accreditation was based on two criteria: shooting down an enemy aircraft over French territory, and confirmation of this by friendly troops on the ground or by two other pilots. 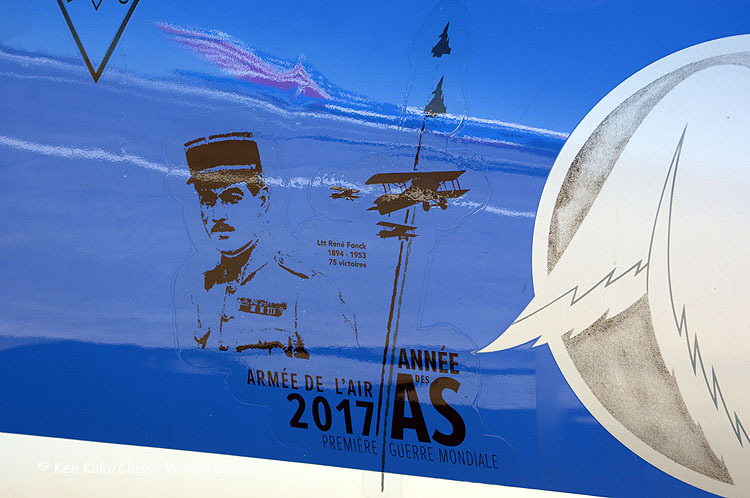 For the US Tour, a portrait of a French World War I Flying Ace will be painted on the side of each of the Patrouille de France’s Alphajets”. 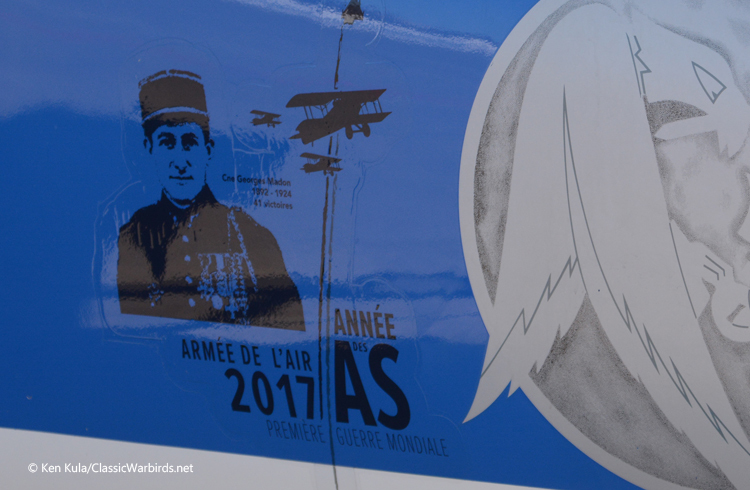 Also, one of the Aces carried is the second highest scoring French pilot, Charles Nungesser, who went missing during a trans- Atlantic flight attempt one hundred years ago in 1927, at age thirty-five. 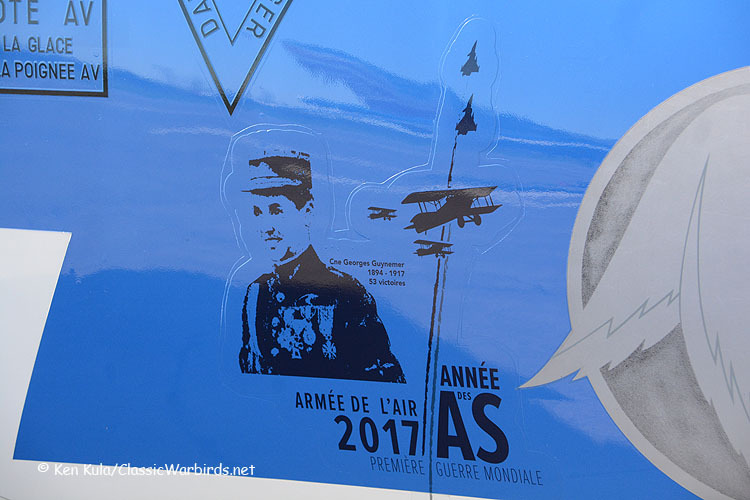 Georges Guynemer – carried aloft by LEADER Squadron Leader Christophe DUBOIS. 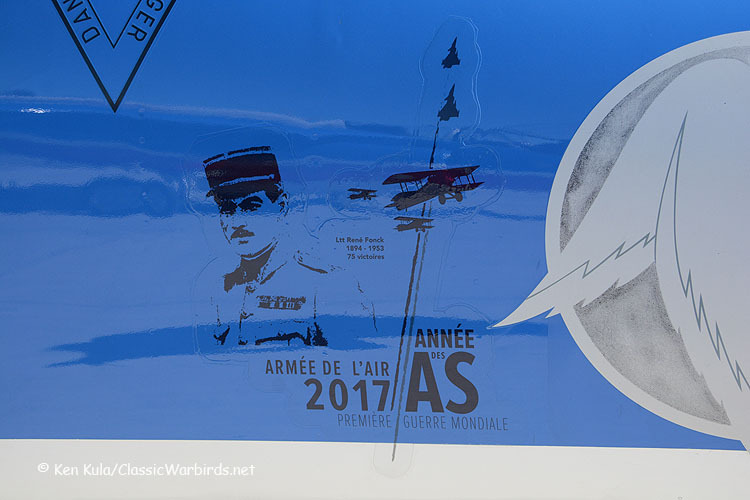 Guynemer scored fifty-four aerial victories over a span of slightly over two years, becoming France’s second highest-scoring ace. A genuine war hero for many French citizens, he flew numerous models of combat aircraft, including Moraine-Saulnier monoplanes and Nieuport and SPAD biplanes. He was shot down and killed on September 11, 1917, at just twenty-two years of age. Joseph Vuillemin – carried aloft by RIGHT WING Captain Damien BOURMAUD. Vuillemin scored seven victories during his service in World War I. He ended the war as a squadron commander, and rose in rank and influence throughout the 1920s and 1930s. In 1938, he was appointed as the Chief of Staff of the French Air Force, and after the beginning of World War II, became the Chief of the Air Staff during the Battle of France. By the end of 1940, he had requested to leave military service, and died on July 23, 1963 at age eighty. Maurice Boyau – carried aloft by LEFT WING Captain Cyril TOUZET. A pre-war international rugby player and captain of the French National Team, Boyau became a leading ace with twenty-one balloon and fourteen aircraft kills to his credit. His thirty-five victories over a year and a half ranks him fifth for the French during the war. His balloon busting skills and courage were remarkable, and his pioneering use of rockets to down balloons towards the end of his service was noteworthy. He was killed on September 16, 1918, shot down by a German air patrol while attacking another observation balloon while only thirty years old. Charles Nungesser – carried aloft by SLOT Squadron Leader Nicolas LIEUMONT. 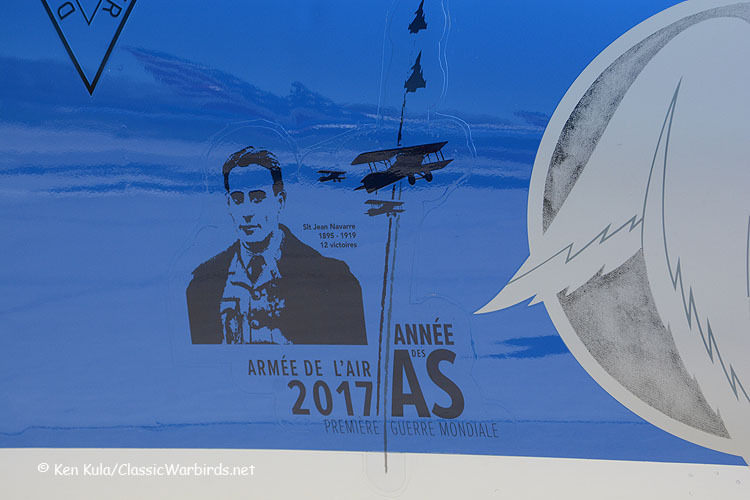 Nungesser became the third highest scoring ace in French aviation during World War I. Originally a cavalryman, he won a transfer to the Service Aeronautique and began his aviation career in 1915. His first victory occurred in July of that year, and he achieved ace status in April, 1916. His last of forty-three victories was scored in August, 1918. After the war, he flew in an aerial circus in America, married an American, and appeared in movies. In 1927, he and navigator Francois Coli departed Paris in L’Oiseau Blanc, or “White Bird”, and went missing while attempting to cross the Atlantic Ocean, bound for New York City. Two weeks later, Charles Lindbergh successfully completed the trip, in reverse fashion. Nungesser was thirty-five years old when he disappeared. Rene Fonck – carried aloft by OUTSIDE LEFT Captain William LEROY. 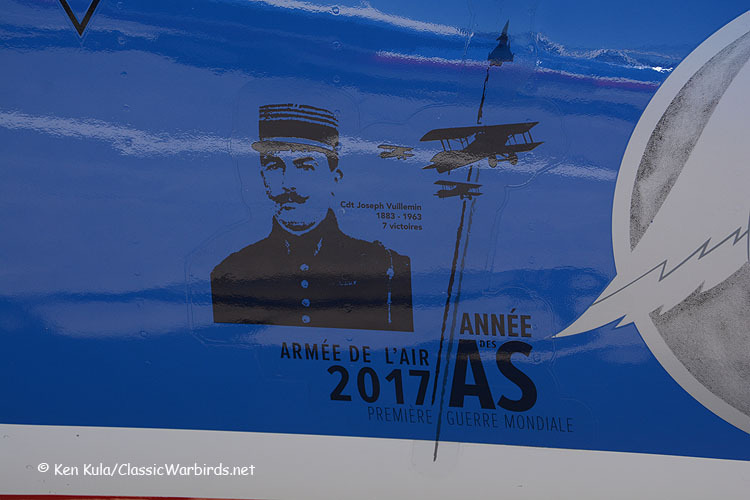 The French Ace of Aces during World War I, Fonck claimed even more victories, but never received credit for them. On August 6, 1916, he was credited for his first victory, and on May 13, 1917, attained ace status with his fifth credited victory. His style of precision flying, using deflection angles, and conserving ammunition drew attention. He was one of only a few Allied aces with high victory totals that never shot down a balloon. After the war, he left military service for a while, but returned in time to become the Inspector of French Fighter Forces just before the beginning of World War II. He died at age fifty-nine, on June 18, 1953. Jean Navarre – carried aloft by OUTSIDE RIGHT Captain Bertrand TARDIF. Navarre entered World War I in September 1914. He attained twelve victories between April 1915, and June 1916. On June 17th, Navarre was shot down, and received a severe head wound in the process. He never returned to the air war because of this injury. However, he was chosen to take part in an unapproved flight during a victory celebration in July, 1919. 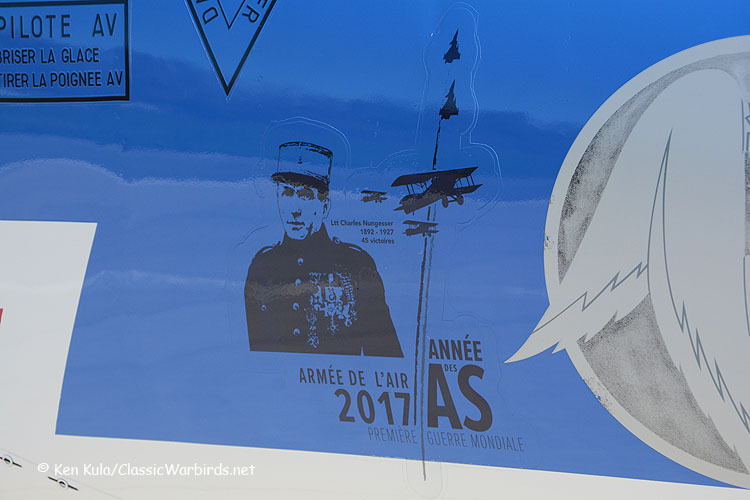 A bit more than a week before the celebration, Navarre was killed while training to fly through the Arc de Triomphe on July 10, 1919. He was just twenty-three years old. Rene Dorme – carried aloft by LEAD SOLO Captain Hervé AUBERT. Although he began his military career as an artilleryman, Dorme transitioned to flying like many other troops. Injured in an air crash before reaching the front lines, his combat career didn’t begin until March 1916. He attained twenty-three accredited victories, and claimed some forty-three more probables. He was killed on May 25, 1917, fourteen months after his initial foray into battle at age twenty-three. Adolphe Pegoud – carried aloft by OPPOSING SOLO Captain Benjamin CHANAT. Pegoud was a test pilot for Louis Bleriot before the war began. He was one of the first pilots to perform a loop in an aircraft, and was the first pilot to use a parachute to escape from his aircraft successfully. Between February and July 1915, he was credited with six aerial victories, making him the first ace pilot of World War I. He was shot down and killed on August 31, 1915 at age twenty-six. The other three Aces are carried aloft by extra display aircraft, including one flown by the RESERVE PILOT, Captain Benjamin MICHEL. Alfred Heurtaux was credited with 21 aerial victories during World War I. He began combat flying on May 29, 1915, got his first victory on July 9, 1916. Some five weeks later, he achieved ace status, his fifth victory. Twice during 1917 – in May and September - he was seriously wounded and left combat flying. He resigned his military commission in 1919, and entered the automotive industry in management positions for Ford and GM. He also was the President of the France Fighter Aces Association at one point. He rejoined the military just prior to the beginning of World War II, and was active in the French Resistance during the war. He died on December 30, 1985, at age ninety-two. Georges Madon was the fourth ranked French Ace during the war, but may have been its’ highest scoring pilot. Bitten by the flying bug by age 15, he tried to attain a military flying position, finally attaining his pilot’s rating in June, 1911. He became one of France’s most experienced military pilots before the First World War. Once the war began, he flew some of the first night bombing missions. He began flying fighters in September 1916, and 18 months later had twenty five confirmed kills. He finished the war with forty-one confirmed victories, and another sixty-four probables. Plus, he had seven years of military aviation experience at that point, a rarity. On November 11, 1924 Madon was killed at age thirty-two when the aircraft he was piloting in Tunisia developed mechanical trouble, and he purposely crashed into a villa to avoid a nearby crowd of people. Dieudonne Costes achieved eight aerial victories during World War I (although one source says only 6 confirmed). He became a certificated military pilot in September, 1912. During the war, he served in the Balkans. After the war ended, he began flying mail on moderately long routes such as Toulouse to Casablanca. Later, after some test pilot work, he would endear himself with long-distance flight records. In 1928, he and Joseph Le Brix completed an around-the-world flight. In 1930, he and Maurice Bellonte flew from Paris to New York, completing the more difficult westbound crossing for the first time. He died on May 18, 1973, at just over eighty years of age. 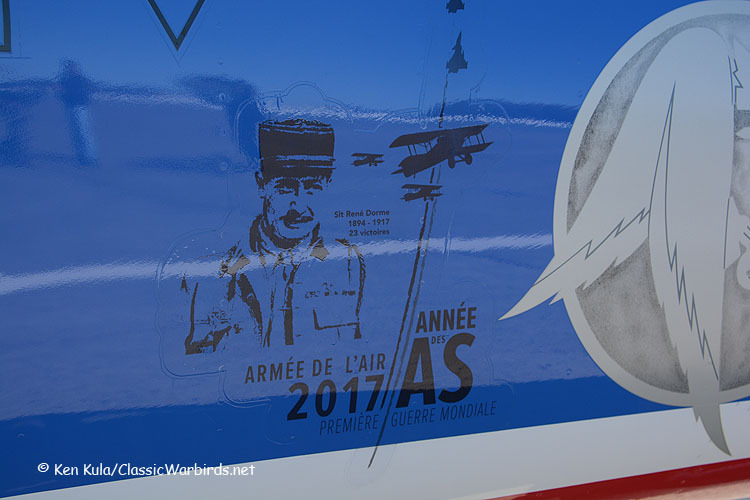 Eleven Aces, and eleven different stories of their accomplishments as French Aces, and beyond. Some pilots didn't survive the war's end, others survived both World Wars and many more years later. Approximately one hundred seventy French pilots became aces, an extraordinary amount. 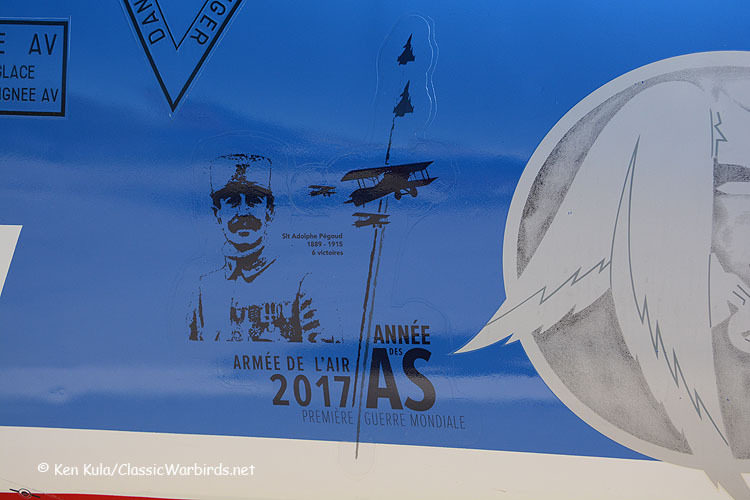 And thanks to today's Patrouille de France 2017 North American Tour, we received a slice of the history of some of their Aces, who fought some one hundred years ago.